When making tie-dyed clothing an important step before you finish the project is to set the dye. 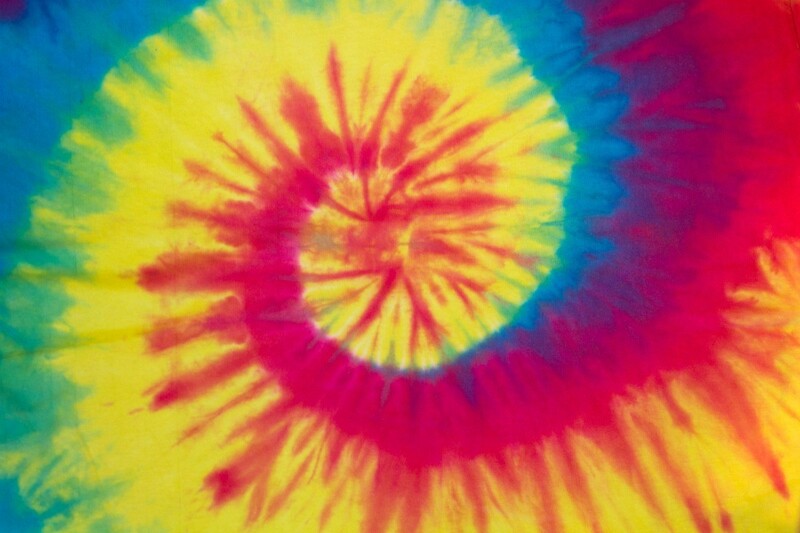 This is a guide about setting the dye when making tie-dye clothing. I purchased a few hand, tie-dyed tablecloths in China and they bleed very badly! They were done in a small village. How can I set the dye in such a large pieces of fabric. Some are a dark blue and another is orange. People I know that have purchased them, say the color washes out very dramatically, so they must be washed alone, separately. They do, however, maintain the dark blue color along with the lighter pattern (that is "tied in") remaining as well. Also, I have a front loading machine that doesn't use a lot of water. Is there a way to set the dye in a large tub or large stainless steel sink? Then wash it in the front loading machine. Or, do I have to go to a laundromat and use a tub machine that fills with a large quantity of water. You might try the cold water and salt routine - in a large bucket or whatever, fill with cold water and a pound or so of table salt (one of those round boxes). Dissolve the salt, then soak the table cloth in the salt water for an hour or so. Then wash in cold water to rinse out the salt, and dry as usual. Not knowing for sure what the dye is, makes it a little tricky. Good luck! The dye is probably indigo same dying as for the jeans. You can try to soak your tablecloth in white vinegar when you rinse it. Hope this helps. Does anyone know the best way to keep the dye set after doing home Tie-dye t-shirts? I've heard something about salt and something about vinegar. Any other ideas? If using salt or vinegar, how do I use them? Approx. 1/2 cup salt in cold water wash cycle. This step can be repeated as an added safeguard if dark or vibrant colors are used. Put white vinegar & water (50/50) in your steam iron turn garment inside out and steam press thoroughly place garment in dryer to finish. During regular wear, I find it helps prevent fading to launder darks & dyed garments inside out (in cold water). Lastly, depending on fabric type, there are some good commercial products available. How do you set tie dye? It's really all about the dye you use in the first place. Never use "Rit" because it's a "fugitive" dye (like indigo or blue jeans are) That means it fades with washing & from sunshine. The best brand is Procion. * If you've already dyed your things, then by all means heat-set your dyed fabric. Either with an iron or in a very hot dryer. When you heat set be careful you don't damage your ironing board with dye. Put an open paper bag over the ironing board Then another one over the tie-dye to help absorb any extra dye. Don't use newspaper or the ink will get on your tie-dye & the ironing board. Also each time you wash your item put about half a cup of any kind of Vinegar in the rinse water. The Vinegar helps set the dye, but nothing takes the place of a quality dye. Another dye that's fun for kids is "Sun Painting" with "InkoDye". This special dye goes on clear then turns bright & permanent with the UV rays from the sun (or you can use it inside with heat). With this solar dye you have to use only 100% cotton or rayon fabrics. This is really fun to do outside on the lawn with kids (in their old bathing suits). You can either dip the fabric into the dye or use a paintbrush to apply it for a different look. This dye isn't as bright as or as permanent as the Procion I mentioned above but the kids love the magic of painting it on clear & watching the color come to life before your eyes! The coolest thing to do with kids is buy a 100% cotton flat sheet at the thrift store & let the kids have their way with it, paining their own colorful sheet! I used Jacquard brand of tie dye for my swimming suit. I've had it sitting for 15 hours. I tried to rinse a small part of it and it seems the dye is coming right out. Is there something I didn't do right? Should I use salt or vinegar when I rinse? Please help! Most of the Jacquard brand of dyes require heat or chemical setting. Check the package directions. Some color will come out even after treatment. It may be as simple as putting the suit in the dryer to heat treat it. Also be aware not all dyes work on all fabrics. My grandchildren have already tie-died some cotton shirts. They are dry. Now, what do I soak them in to set the colors? I remember something about using salt in solution, but have no idea how much to use or if there is something better to soak them in. I am a quilter and we set dark colors with a vinegar rinse. Use white vinegar, a cup per gallon cool water, soak each shirt 15 minutes, then rinse out by hand and dry out of sun. Sun will bleach any color. I hang them over a sink on a plastic hanger after ringing them out by hand and flattening into shape again. Will using a dye fixative work on tie dyed shirts that have already been rinsed, or is it too late? Either way, how exactly is it done? It seems that it can still help "fix" the dye but not as well as if used immediately after dyeing. Commercially dyed items and previously hand-dyed items can also be treated with ColorStay Dye Fixative before laundering for the first time. However, the results may not be as apparent or long-lasting as when used after your own Rit project. "Sometimes people try Rit Dye Fixative with Rit All-Purpose Dye for tie-dyeing, but this is not a good idea. Rit Dye Fixative doesn't work for tie-dyed garments that have been dyed in multiple colors, which require a completely different kind of dye. Since Rit Dye Fixative cannot be used without immersing your garment in water, it is suitable only for pieces that have been dyed a single solid color. If you try to tie-dye multiple colors with Rit dye and then fix with Rit Dye Fixative, your colors will bleed together. It's important to use fiber reactive dyes, such as the dyes in good tie-dyeing kits, if you want to tie-dye; if you use fiber reactive dyes, you will not need to use a product like Rit Dye Fixative, because the dyes are permanent without it, when applied according to the instructions." There are several videos on YouTube about using dye fixative (Google How to use dye fixative). Here is a link that has a lot of information but it is a long "read". My daughter did some food colouring tie dye yesterday and just loves the bright colours. We did not wash out the dye after, instead we put the clothing on the line to dry and then in the dryer to hopefully set the colours. We did firstly rinse the item in cold salty water. So my question is how can I make the colours hold their brightness? We do not want this to wash out if that is possible. Thanks. I love tye dye it's so creative and fun, I have encountered the same problem. In the tye dye kits you get at Walmart included in them is a product called soda ash this apparently locks in the color and keeps it from fading, bleeding out on other clothing when washed. If you don't want to buy the whole kit, you may be able to find it sold separately if not at Walmart then your local craft store. Can I put all of my dyed clothes in the same bucket to set the dye or do I have to do it separately? Only put together if they are dyed the same color. How much salt and vinegar do you use for one shirt? The colour of my new tie dye dress bleeds on my skin, how do I fix it?